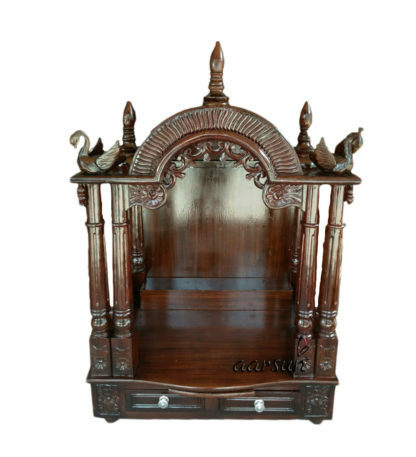 Aarsun Woods brings to you this state-of-art Handcrafted Wooden Temple in premium quality Teak Wood (Sang-wan Wood / Sevan). The temple is mounted on circular piers and above that there are two drawers with brass knob with placing some puja essentials. Above the temple there is main place for the deity where you can place your idols. There is beautiful carved pillars at the front of the temple.At the main place of the deity there are levels where you can place your idols and lighten up diya and incense sticks.Rising to the roof of the temple there is beautiful curve design where there are two peacocks placed at the sides of the temple. 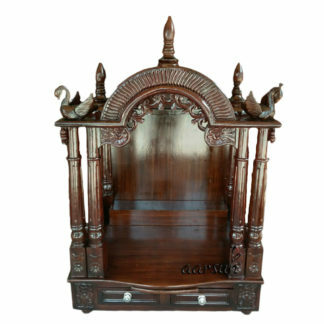 At the top of the roof there are three shikhara placed which give very traditional look to the temple.Temple has beautiful carving which give traditional and appealing look to the temple.The temple is made up of premium quality seasoned Sheesham wood and is best suitable for the home and for the offices. As we are the manufacturers so each unit is customized to perfection by skilled craftsmen with export quality finishing and we provide free shipping across India. We at Aarsun Woods, strive to offer the best value and service possible.